You still have few weeks to visit an interesting exhibition in Calgary, to which we’d like today to draw your attention. A trenchant title – Transformations – and a fascinating theme – the representation of the First World War in the visual art – characterizes this exhibition produced by the Canadian War Museum in cooperation with the National Gallery of Canada, running from September 2013 till January 12th 2014 at the Glenbow Museum. 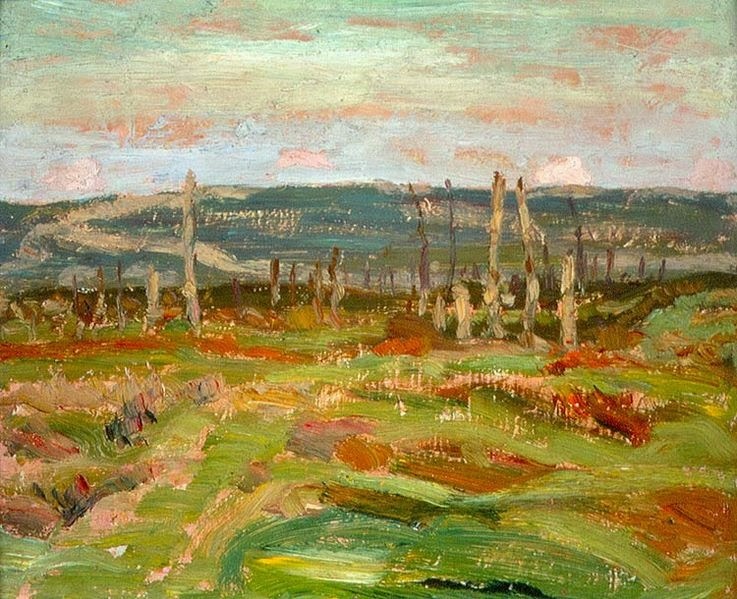 It collects war-influenced paintings, including works by the renowned Canadian painter A. Y. Jackson (1882-1974, see his Vimy Ridge from Souchez Valley, 1917, in the picture above) and the great German Expressionist Otto Dix (1891-1969). Especially the landscape paintings of both authors reveal the strong impact of the Great War on their artistic output - maybe a way to elaborate the tremendous experience of the conflict. A. Y. Jackson enlisted in the Canadian Army’s 60th battalion, arrived in Le Havre, France, on February 1916, and was sent with his unit during the spring of the same year to the region of Sanctuary of Wood, just outside Ypres. In June he was wounded during a heavy barrage by German artillery in the Battle of Mount Sorrel. 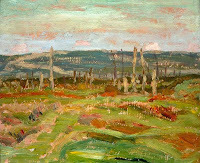 After his recovery he was transferred at Shoreham, England, where in the summer 1917 he met Lord Beaverbrook, a member of the Canadian War Memorials Fund, who engaged him as official painter: he spent therefore the following months, till 1918, between the Flandres and the battlefields and his London studio. On the other side of the front line, also Otto Dix took actively part to the Great War. He enrolled as a volunteer in the German Army and was sent to the Western front where he fought during the Battle of the Somme. In November 1917 he then moved with his unit to the frontline with Russia and at the beginning of 1918 once again in the Flandres. Two men, fighting on the opposite sides of the battlefield, expressed in their following artistic effort the traumatic experiences of the Great War and translated in images – especially of landscape, on which the exhibition focuses – how the ideas about the birth, death and rebirth of nations ruled in a sometimes unconscious way human history during those years and dramatically few decades later during the WWII. An introduction to the exhibition and further information here.